Ce condo est sur Village Trail pente. De l'image (prise 12/17/10) vous pouvez le voir il est vraiment skier à partir du pont. Seven Springs est «le» lieu de l'être pour le ski, si votre truc ce est bas de la colline ou parc à neige. Ce condo est idéal pour votre vaction d'hiver ou tout simplement une escapade courte. Le spa récemment ouvert au Seven Springs était un plus agréable. Saisons non-ski sont merveilleux sur la montagne ainsi avec une grande variété d'activités. Nous sommes toujours dans les bois ou sur les pistes cyclables ou de randonnée. Après de nombreuses années de plaisir de la montagne, il est venu le temps de passer à autre chose. Appelez-moi si vous tombez en amour que je ai fait et que vous voulez faire votre propre. Super easy check in and check out. Great communication with the renter. and clean condo what else can you ask for. I would definitely stay here again when skiing. Condo has everything a family of 5 needs. Shuttle service was a very reliable option esp with the MLK weekend busy-ness and deep freeze/snow storm. Owner was very considerate and generous when we asked to extend our stay for a day due to the storm. Kitchen was fully equipped, closet had more than enough blankets, another closet was full of board games. Can’t ask for more. 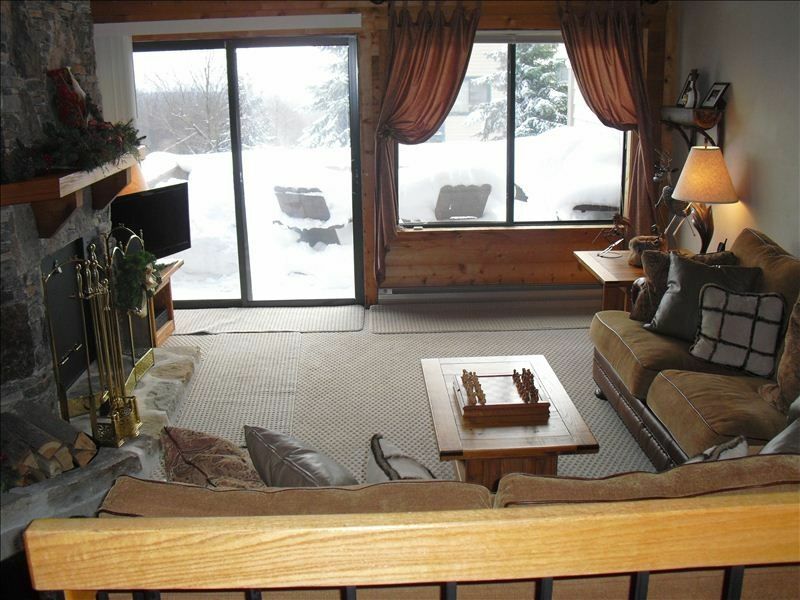 This condo's deck is located directly across from of the hairpin turn of the Village Trail. Even though the the Village Trail was closed during our stay, we took our chances and skied to the bottom anyway. Very convenient location. The owner of this property was very responsive to any questions we had. The condo had everything we needed and more. (The rooms are actually bigger than they appear in the pictures. For the wine enthusiast, the nice wine glasses are in the cabinet above the fridge. Condo is as described. If you're comparing to the trail map, trying to understand where this unit it, it on the farther end of the village trail, where it shows 'woodridge' on the map and the village trail extension is, although it is in the sunridge area (trail map is not accurate). Despite being there at the beginning of Jan the weather was not favorable enough to enjoy the ski in/ski out - village trail was closed. Had it been open, it'd be perfect. Unit is spacious and well equipped. Lots of parking out front. When wanting to ski, we drove a little up the road and accessed the slopes about where avalanche lifts lets off. even though the weather wasn't great, we still had a very memorable time and enjoyed ourselves immensely. Mike was very helpful and provided very clear instructions. Please note, not a working fireplace. Good location, just off village trail. Really nice space for a couples weekend! Would highly recommend this rental.